Digital content storage, reader and syncing service Pocket, formerly known as "Read It Later," released a substantial iOS app update on Wednesday, expanding its social networking functionality to in-app sharing with friends who also use the app. Pocket version 4.5 brings a few major enhancements to its standing feature set, the most interesting being the new "send to friend," which lets users share their favorite articles, videos, webpages and more, quickly and easily. And if the recipient also has Pocket, they will be notified of the incoming share in-app or via push notification, as well as the usual email with Web link. Users can comment on shared videos, and make quick highlights in text stories, which are embedded into the sent content. The messages will show up in a new inbox within the Pocket app. Previously, Pocket leveraged existing social media tools like Twitter and Facebook to share a user's content, but with Wednesday's update, the company looks to make sharing a more integral part of the app's experience. 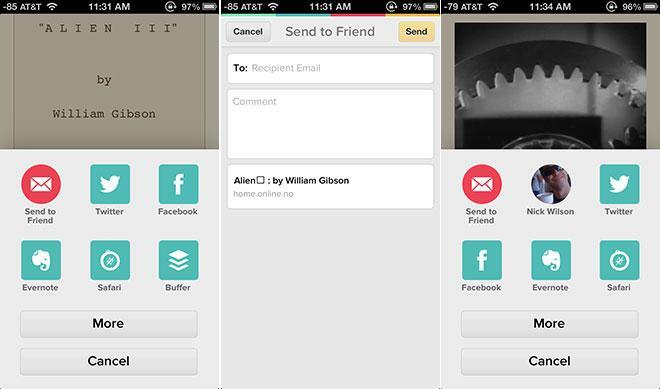 In addition to the new sharing features, Pocket also includes a number of bug fixes and performance updates. Pocket for iOS v4.5 comes in at 13.6MB and can be downloaded for free from the App Store.